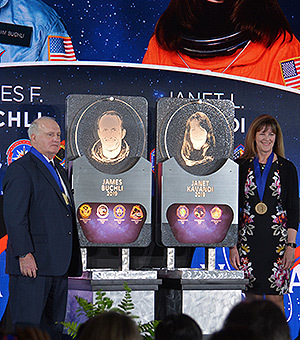 — Although their own space missions came decades after the first humans landed on the moon, Jim Buchli and Janet Kavandi have now joined the same ranks as Apollo 11 astronauts Neil Armstrong and Buzz Aldrin. Veterans of NASA's space shuttle program, Buchli and Kavandi became the 98th and 99th space travelers to be inducted into the U.S. Astronaut Hall of Fame on Saturday (April 6). A public ceremony held under the display of the retired space shuttle Atlantis at the Kennedy Space Center Visitor Complex in Florida brought together Gemini, Apollo, Skylab and space shuttle astronauts to welcome Buchli and Kavandi into the Hall. "I can't think of two more deserving individuals," said Bob Cabana, the director of NASA's Kennedy Space Center and a four-time space shuttle astronaut. 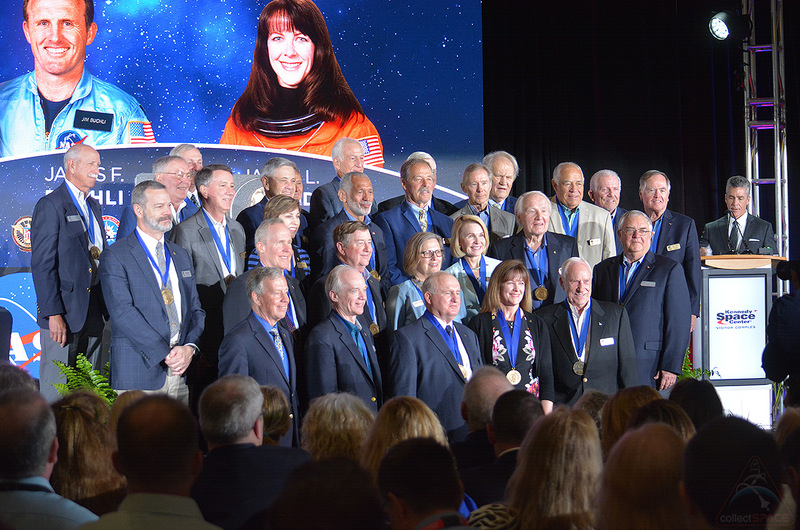 "The astronauts that you see here today all appreciate you and your extraordinary contributions to the future of human spaceflight," said Mike Coats, a three-time space shuttle pilot and commander and the former director of the Johnson Space Center in Houston. "They warmly welcome you into the Astronaut Hall of Fame." Both Buchli and Kavandi said they were humbled by the honor. "This is something my family and I will remember for the years to come. I want to thank the members of the Astronaut Hall of Fame for inviting me to join their ranks," said Buchli, who launched on four missions between between 1985 and 1991, logging more than 20 days in orbit. "I am both humbled and honored for this acknowledgment." "We are very humbled to be here and very humbled to be recognized by all of you, our heroes," said Kavandi, who flew on three missions between 1998 and 2001, spending 34 days off the planet. 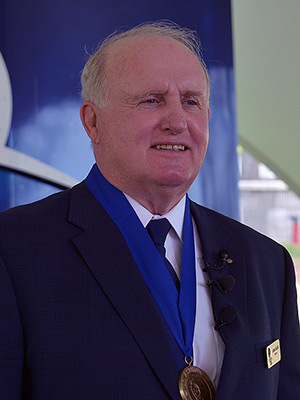 Buchli was selected with NASA's 1978 astronaut candidate class, the first group to be chosen for the space shuttle program. He orbited Earth 319 times as a mission specialist on STS-51C, STS-61A, STS-29 and STS-48, flying with a still-classified military payload, conducting science research and deploying NASA satellites. "My four space shuttle missions came rather rapidly once the program began to gain experience," said Buchli, who at 73 is now retired. "I flew twice in 1985, again in 1989 and my final flight was in 1991. Each flight was unique in mission objectives and crew make up. On each, I endeavored to the best of my abilities to execute my role as professional as possible, lead where required and support others in their functions." 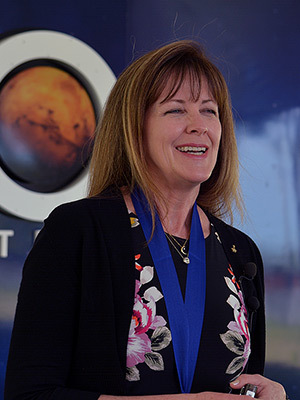 Kavandi was a member of NASA's 15th class of astronaut candidates, recruited in 1994. She served as a mission specialist on STS-91 in 1998, STS-99 in 2000 and STS-104 in 2001, visiting both the Russian space station Mir and the International Space Station, as well as helping to collect the radar data for a topographical map of Earth. 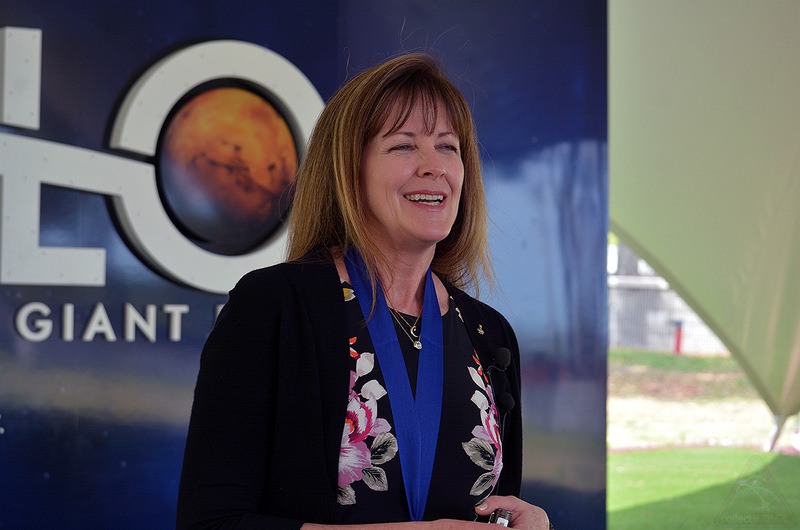 "I am so fortunate to have had the opportunity to see the world from above it and on it," said Kavandi, who today serves as the director of NASA's Glenn Research Center in Cleveland, Ohio. "All of us here are so lucky to be part of this amazing endeavor." "We, the lucky few here, got to be on the fun side of things. We got the shaking and the rolling and were rewarded with a magnificent view of the planet once we reached orbit," she said. 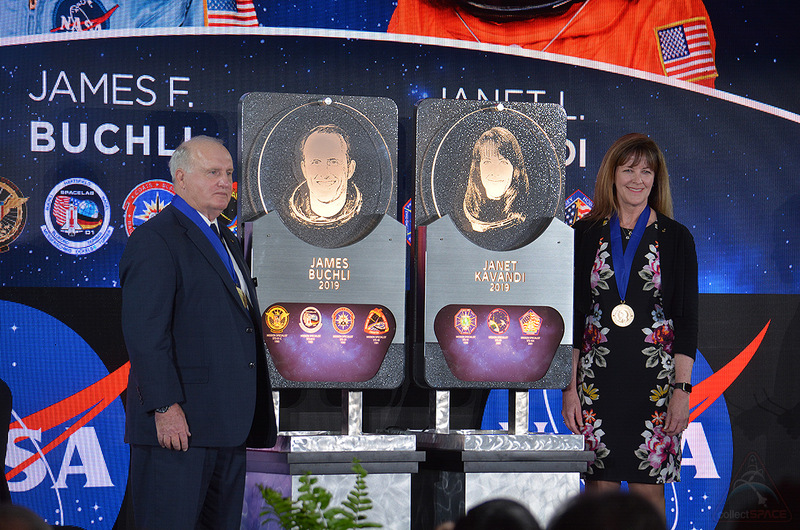 "Janet Kavandi and James Buchli represent the best of America's astronauts," said NASA Administrator Jim Bridenstine in a statement. "Each has contributed greatly to the NASA mission, and their efforts have helped lay the groundwork for where we are today — including Janet's leadership directing Glenn's Moon to Mars work — as we chart a course for a return of American astronauts to the lunar surface in five years, and eventually on to Mars." Buchli and Kavandi each reflected on how their spaceflight careers followed the first push to the moon 50 years ago and how what was learned on their missions will inform the next missions to explore the lunar surface. "I have always wanted to go to the moon. I am right in between, just in the wrong place, to do lunar work myself. But I am trying to help people get there," Kavandi said. "As the crew of Apollo 11 was reaching the pinnacle of their flying career, I was starting mine," said Buchli, who watched the first moon landing as an officer in training at the Naval Air Station Pensacola in Florida. "The thing that I think is really remarkable is that every one of the people who has flown into space, when it is there turn, they step up to the challenge and do it right. You can say that about Apollo 11, they stepped up to the challenge and did everything right, it was their turn to fly and they executed perfectly. And so when it is your turn, you do the mission that you're assigned to and you do it to the best of your abilities. I am just happy to be part of all of that," Buchli told collectSPACE. "We have built on the work and sacrifices of those men and women who executed the programs before us," he said. "Those who come after we are gone will build on what we've done. I hope that our legacy will be that we have passed the torch of excellence on and that future programs learn from what we have done, both right and wrong." 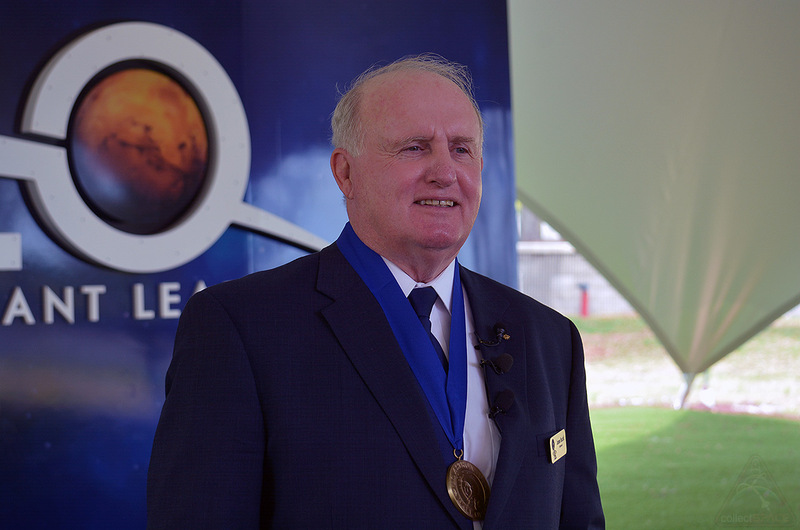 "As we have stood on the shoulders of earlier space explorers and their programs, so will those who come in the future and gain from where we have been," he said. 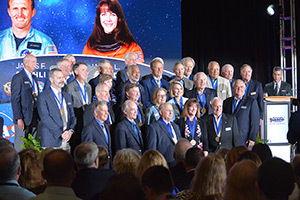 New inductees Jim Buchli and Janet Kavandi stand among fellow U.S. Astronaut Hall of Fame members following their induction ceremony on Saturday, April 6, 2019, at NASA's Kennedy Space Center Visitor Complex in Florida.